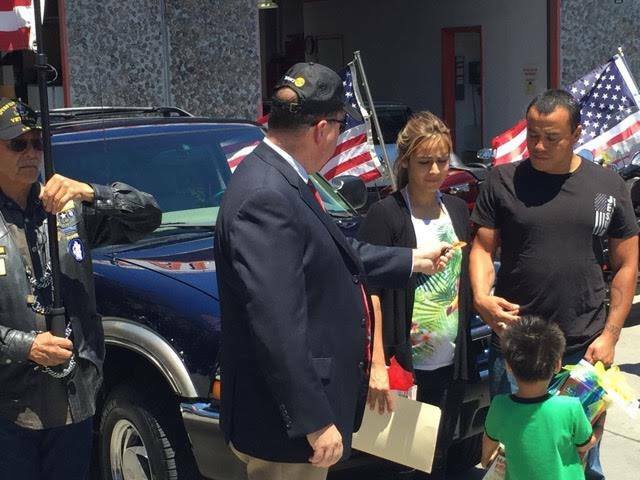 On Tuesday, July 5, 2016, the Rotary Club of Belmont/Redwood Shores commemorated the Fourth of July holiday by giving away a car to a wounded United States military combat veteran. Working with James Brown of the Wine Country Marines, Roberto Rojas a navy veteran combat injured in Fallujah, was selected as the recipient. 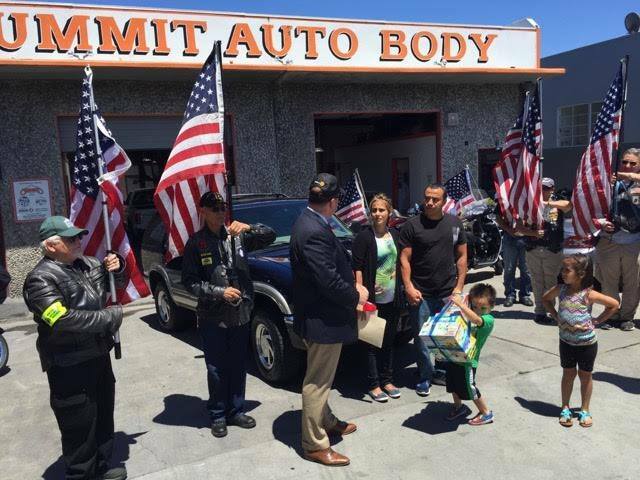 It is fitting that the Belmont & Redwood Shores Rotary Club along with our Cars For Vets program could celebrate Independence Day by providing a vehicle to a combat-wounded veteran. 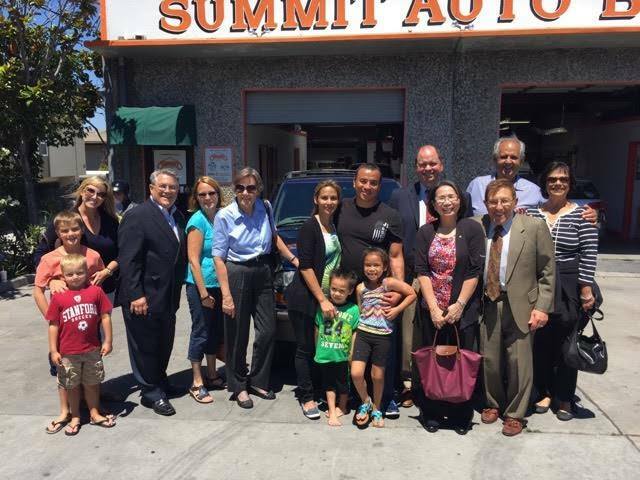 On Tuesday, July 5, 2016, the Belmont & Redwood Shores Rotary presented a refurbished Chevy Blazer to Roberto and Maria Rojas and their two lovely children. Roberto, his wife Maria, their five year old daughter, and three year old son are transitioning from many months of being homeless. The acquisition of this vehicle means he and his family will have reliable transportation for his ongoing therapy and medical care. Roberto was a Navy communications specialist, serving with the Marines during the battle of Fallujah, Iraq, in 2004. Roberto's vehicle was hit by an IED (improvised explosive device) and Roberto suffered severe head trauma and traumatic brain injury. In this photo, new club President Geoff Wiggs gives the keys to the new car to Roberto and Maria. Belmont Redwood Shores Rotary President Geoff Wiggs handed over the keys to Robert and Maria at a small ceremony attended by some of Robert’s fellow servicemen from a group known as “The Patriot Guard Riders” along with members of the Belmont Redwood Shores Rotary Club and Belmont Police Chief Dan DeSmidt and six of his fellow officers. To assist the Rojas’s on their way Dennis Pettinelli and his company Pettinelli Financial Partners, presented the family with Gift Certificates for Gas and merchandise as well movie gift cards and toys for the children. The vehicle was inspected, detailed, and refurbished by Chris Zammit, owner of Summit Auto Body in Belmont. Chris assists the Rotary Club in preparing the vehicles for the recipients. Working with local merchants, Chris helps arrange necessary services and parts and makes sure that the vehicles are safe and road worthy. In this case the vehicle required only minimal brake issues which were generously taken care of by Frank Alaimo of A & E Automotive, San Carlos. 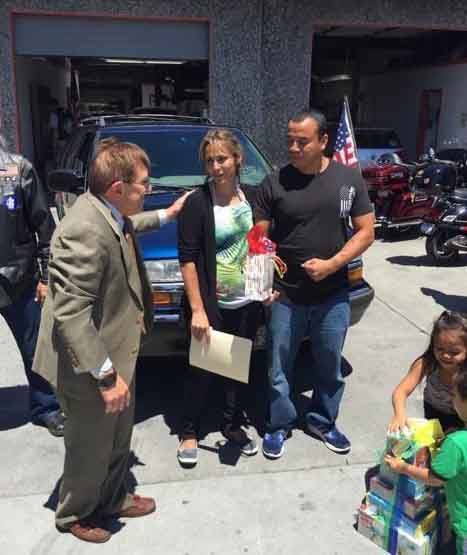 The Rojas family was located through the assistance of James Brown of Wine Country Marines. Wine Country Marines is a patriotic organization of Marines and friends of the Corps dedicated to perpetuating both the ethos and the esperit de corps of the US Marines as well as charitable works in assisting veterans and combat wounded military men and women. This vehicle represents the tenth such donated vehicle by the Belmont & Redwood Shores Rotary Club since the program began.